Our most famous creation. Oven-baked until golden brown and served with whipped butter, lemons, powdered sugar, and hot maple syrup. Please ask your server for a current cook time. Served with wipped cream and strawberry syrup. All pancakes are available in short orders, please ask for size and pricing. Gluten Free Batter is available at no charge for some of our pancakes. Our omelettes are 4 eggs baked fluffy and served with 3 buttermilk pancakes, or toast, or an available substitute for an extra charge. Choice of cheddar, swisserella, American, pepper jack, or goat cheese. Egg substitute or egg whites available in your omelette. Our fluffy souffle omelette baked with mushrooms, spinach, and goat cheese. Our owners’ favorite omelette! Your choice of steak or rotisserie chicken with sauteed green and red peppers and onions with pepper jack cheese. Sour cream and salsa by request. Egg whites, chicken sausage, red pepper, spinach and light on the cheese. Served with fresh fruit. Served with 3 buttermilk pancakes or toast or an available substitute for an extra charge. Cherrywood smoked served with hashbrowns. Three slices of our very special thick-sliced bacon and two eggs. No one else has bacon like this! Hash browns topped with scrambled eggs, pepper jack cheese, red pepper, jalapeño, bacon and chorizo. Served with cakes. Fried egg, ham and cheese grilled on your choice of bread served with fruit. Housemade crab cakes made with 100% premium meat served on a toasted English muffin with two poached eggs topped with hollandaise sauce. Served with a side of hasbrowns. Rotisserie chicken, green and red peppers, onion and chipotle ranch sauce. Served with fresh fruit. Diced ham and cheese topped with mushroom sauce. Served with fresh fruit. Raspberry monkey bread drizzled with vanilla glaze. Palmetto Farms, South Carolina. Also available with cheese. Our own blend. Our pride and joy. Served with a French loaf. Our homemade pecan chicken salad surrounded with a medley of fresh cut melons and other fruit. Tasty rotisserie chicken, chopped , avocado, grape tomatoes, bacon, dried cranberries, granny smith apple, pecans and gorgonzola cheese crumbles, tossed in our own honey lime dressing. Chopped romaine lettuce with diced chicken, yellow corn, black beans, tomatoes, avocado, red onion, corn tortilla strips and cilantro, tossed in our own chipotle ranch dressing and topped with pepper jack cheese. Mixed greens, grilled 6oz steak, grape tomatoes, red onion and gorgonzola crumbles tossed with balsamic dressing. Soup or a soup of the day. Served with a pickle and your choice of kettle chips, homemade potato salad, or fruit or Cottage Cheese. Multigrain, pumpernickel, sourdough, or white . Delicious premium beef done just how you like it, on a grilled sesame bun with lettuce and tomato on the side. Premium ground white turkey seasoned just right, with lettuce, tomato and chipotle ranch, all on a grilled sesame bun. Fresh sliced corned beef or turkey breast, with sauerkraut, Swiss cheese and horseradish sauce, grilled on fresh pumpernickel bread. Our very own egg salad on your choice of bread or ciabatta roll. Smoked turkey breast, thick-cut bacon, tomato and lettuce, with lemon garlic mayo or chipotle ranch. Our famous thick-cut bacon, with lettuce, tomato and our special sauce, on your choice of bread or wrap. We can accommodate most of our guest’s custom requests, special needs, or new ideas. Our entire menu is available for carry out. 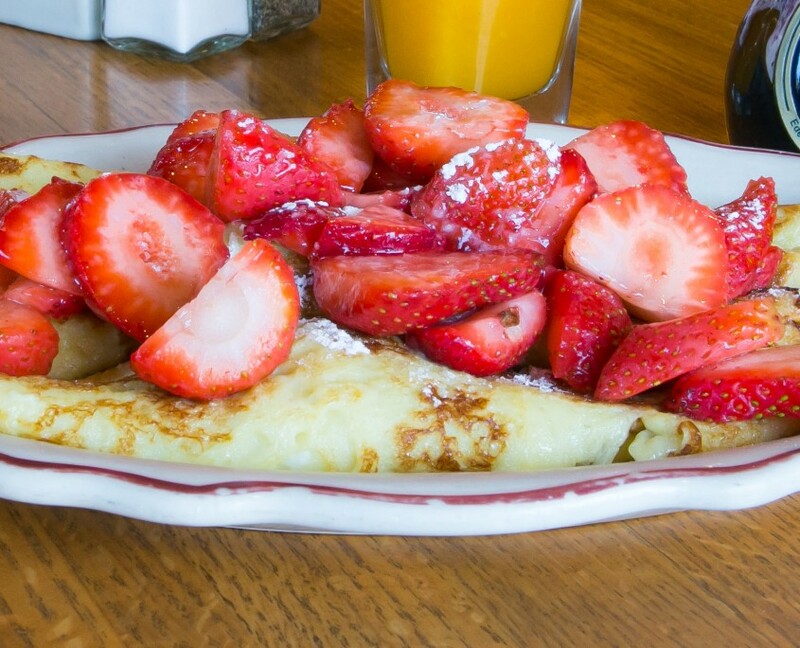 Gluten-Free substitutes are available for all of our crepes, French toast and many pancake flavors at no extra charge. Peanut oil and other allergens are used in many of our batters. Please ask for a manager if you have allergy related questions or concerns.